If you have kids–or grandkids, nieces, nephews, or young cousins–the summer is a great time to put them on the road to financial independence. Since schools are sadly lacking in personal finance education, money management for kids starts at home (and the earlier the better). Teaching children or teens simple concepts and hands-on money management skills makes a huge difference in how they handle personal finances for the rest of their lives. The MONEY account is designed to help teens save and spend money responsibly—with guidance from their parents. Now, you and your teen can manage money together online or with a mobile app. The account is FDIC-insured, comes with a debit card, access to over 35,000 free ATMs, no fees, no minimums, and earns interest! Teens can deposit paychecks using direct deposit or by simply taking a picture of a paper check using a mobile app. Or you can make an electronic transfer from another account to pay their allowance. Kids use a MONEY account to keep track of their savings and spending and you get an email or text alert whenever a transaction is made. You give them the independence to make purchases and manage their money, but maintain oversight so you know how they’re doing and can offer guidance. Piggy banks are great, but the Kids Savings Account teaches kids that saving using online financial tools is easy and fun. The account is FDIC-insured, has no fees, no minimums, AND earns a very competitive interest rate! Click here to learn more about everything the Kids Savings Account has to offer. FamilyMint isn’t a real bank account, but an application that allows kids to log in and track their money. It’s the perfect way for kids age 6 and up to make deposits, set up savings goals, and transfer funds into savings accounts, through a virtual interface. Every dollar in FamilyMint is real money that you owe your kids–because you become their bank. For instance, if you owe them allowance or give them a cash gift, they can log in and make a deposit to track the money. If kids want to withdraw their cash, you can give it to them and then they log in and enter a withdrawal so their balance is always up-to-date in the program. 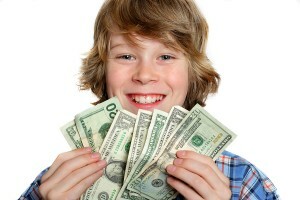 Kids manage their money, but you approve the transactions and can even set up recurring deposits for allowance. Young people learn by doing and their information is only accessible by you. The Enchanted Collar™ is a series of books for kids as young as 6 or 7. They teach real-life financial lessons and moral values through Eli’s adventures with his friends. 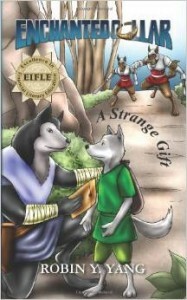 Book 1: A Strange Gift describes the use of money and the importance of honesty and dependability. Book 2: Dog Fight teaches the necessity of budgeting and the value of courage and loyalty. Book 3: Paradise Lost teaches how to acquire valuable job skills and the value of patience and tenacity. Book 4: Squirrel Pot Pie teaches the lesson of savings and the value of leader ship and compassion. Book 5: Bandits and Robbers teaches the lesson of banking and the value of teamwork and collaboration. Moonjar products make it fun and easy for families to start the conversation about money as early as possible. The name Moonjar comes from the idea of “Shooting for the Moon” and creating Big Dreams, along with the ancient custom of placing hopes and dreams in a jar.